art appraiser | Skinner Inc.
Last week, I had the opportunity to travel to Florida for one of the year’s most spectacular art shows: Art Basel Miami Beach. I spent the first part of the trip with fellow art appraiser Kathy Wong, and then my husband and 7-year-old son joined me as traveling companions. In addition to spotting famous and emerging artists (Julian Schnabel, Orlan, the controversial Mr. Brainwash, and Marina Abramovic, to name a few), we snapped photos of many pieces of art that struck us as beautiful, original, shocking, or thought-provoking. 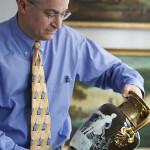 You can view the full gallery on the American & European Works of Art Facebook page. 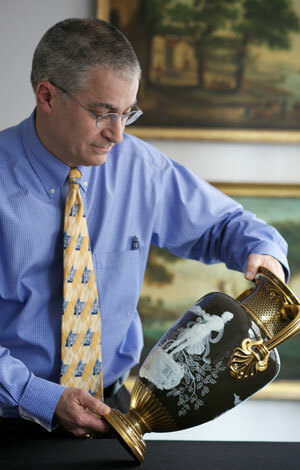 I’m surrounded by art in my job as an auctioneer and appraiser, but sometimes that’s still not enough. There’s more art out there than I’ll ever be able to see—some of it located in far flung reaches of space and time. If I had a futuristic portal I could step through right now, here are five places I would go.